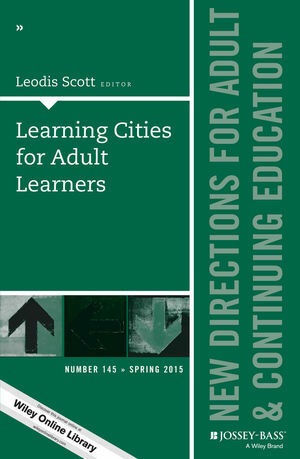 Learning cities call for a connection of adult education to elementary, secondary, and postsecondary institutions along with vocational and corporate workspaces. • leisure, recreation, and public health education. This is the 145th volume of the Jossey Bass series New Directions for Adult and Continuing Education. Noted for its depth of coverage, it explores issues of common interest to instructors, administrators, counselors, and policymakers in a broad range of education settings, such as colleges and universities, extension programs, businesses, libraries, and museums. Leodis Scott is a cofounder and research scholar at LearnLong Institute for Education and Learning Research, and lecturer in adult learning philosophy and practice at DePaul University-School for New Learning and Columbia University-Teachers College. A discussion of learning cities requires social sustainable change that traces its roots back to the idea of a “learning society,” which featured a lifelong education movement long before the common expression of lifelong learning. Community engagement scholarship describes the mutual relationship in higher education for civic, community, and public engagement that create systems for service learning in the context of a learning city/region. Interconnections between workplace and organizational learning inform how learning cities and regions must function to promote learning for a larger society. Public libraries, land-grant institutions, and Cooperative Extension are just a few existing examples in America concerned with adult education serving the larger adult learner community. Health and education must be included in any strategic planning of learning cities; such implications must consider how to improve the social quality of life for children and adults. Leisure shares a special connection with adult education from ancient times to significant events in history such as the Industrial Revolution; these connections play a part in the need for leisure education that is essential for social and human development. Through encouraging leadership from the adult and continuing education field, the idea of learning cities can be realized and implemented within existing communities across America.